Which do you think gets your house hotter during the summer, cooking inside OR going in and out to cook outside on the grill? One night this week, I cooked a meat sauce and vermicelli on the stove top and garlic bread in the oven. It was 95f outside and 71f inside. The temperature inside rose 4 degrees to 75f. The next night it was 95f outside and 71f inside. 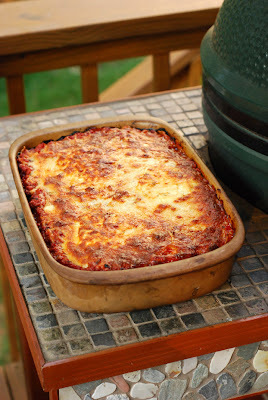 Alexis cooked her lasagna and garlic bread on her Big Green Egg outside and the temp only rose two degrees to 73f. 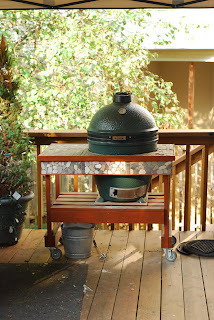 Just one more reason to be cooking outdoors! If your grill's thermometer is held in place with a spring clip on the inside of the grill, take it off so your thermometer spins freely. Then, when you are cooking, rotate your dial so the target cooking temperature is at 12 o'clock at the top. Here I have 350f at the top. Then you can see from a quick glance at a distance if you are on your desired cooking temp. You can't read the numbers from here but because it's easy to tell if the red needle is straight up and down. Mix together the ricotta cheese, eggs, basil, oregano, parsley, garlic and 2 cups of the mozzarella. 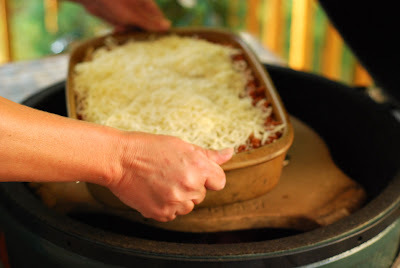 Cover the bottom of a 13 x 9 stoneware casserole dish with a layer of the noodles. 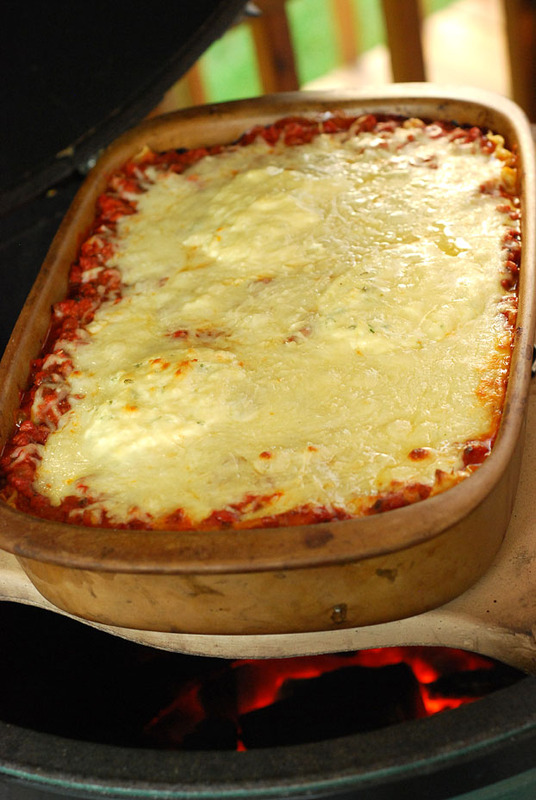 Top with a layer of the ricotta mixture. Sprinkle a little more mozzarella on top, maybe 1/4-1/2 cup. Cover with another layer of noodles and add one half of the meat sauce, spreading it evenly. Click on picture for animation. Preheat your grill to 375f set up for indirect heat. 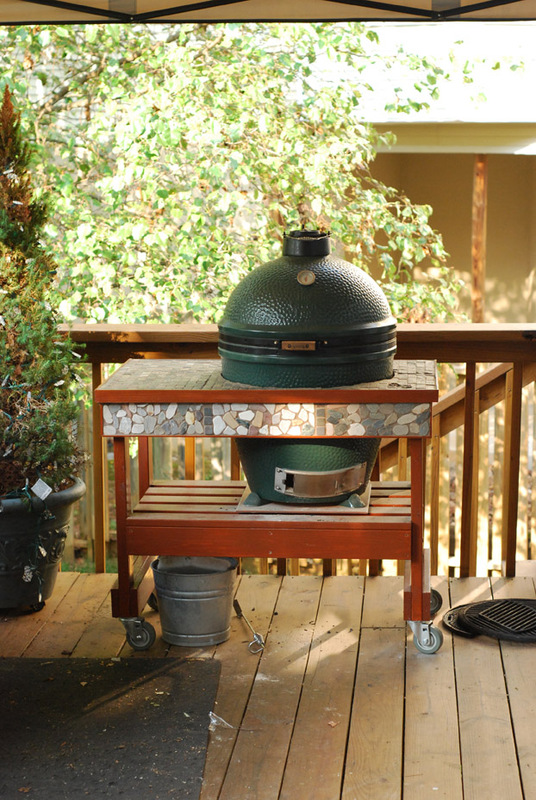 The Big Green Egg and other ceramic cookers are IDEAL for this since they are effectively wood/coal fired brick ovens. In this case, Alexis set up her Egg in the convection oven configuration with the plate setter in, legs down. She put spacers so the casserole dish did not sit directly on the plate setter. 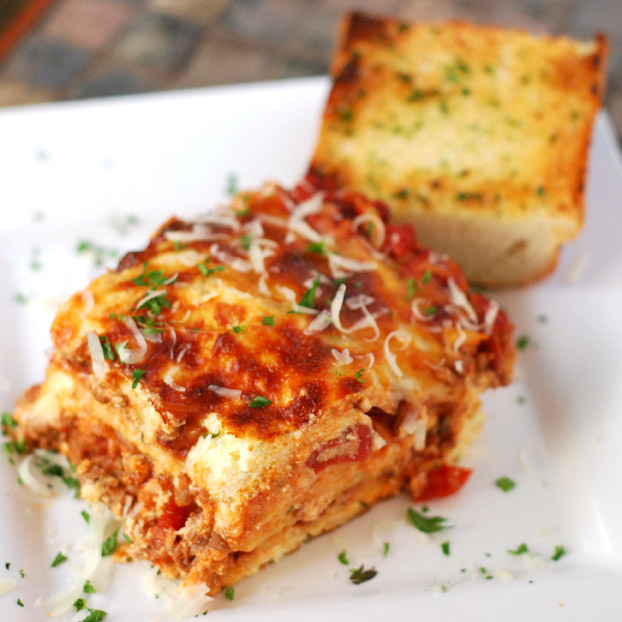 Cook the lasagna for 1 hour or until hot and the cheesey gooey crust is golden brown. She rotated hers once during the cook for even cooking. Remove from heat and let rest for 15-20 minutes to cool down. Meanwhile place 1/2 loaf of french bread, split, face down directly on your plate setter (only if it is clean like Alexis'. I would have to put foil on mine before doing this). For regular grills, you could use a preheated pizza stone as long as it was HOT. Cook the bread cut side down for 2-3 minutes until browned and then flip. 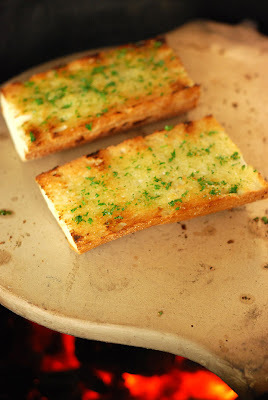 Brush with a mix of clarified butter, parsley, and minced garlic. Cook for 2 minutes more or until golden brown. Fire roasting the lasagna really brought out certain flavors. The meat sauce was a little sweeter and the crispy cheese picked up a slight smokiness. It was excellent. Not only did we have it for dinner last night and for lunch today, we're finishing it off for dinner tonight. 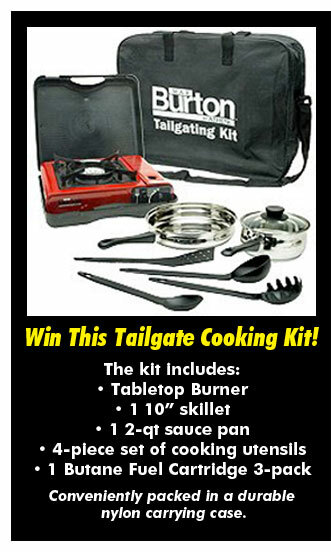 Philly-Gourmet Meat Company has a contest running where you could win this Burton tailgaiting kit. 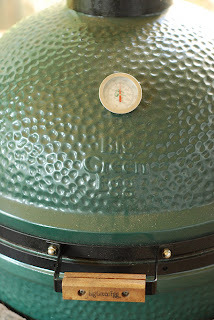 They are having the Philly Gourmet Grand Slam Burger Recipe Contest from April 15th through July 15th, 2011. 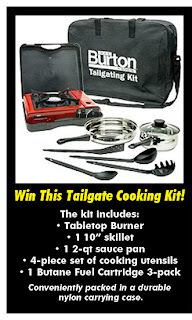 Click HERE for a link to their site and details on how to enter.